Alchemy of Art: Friend or Foe? the lowly dandelion seen in a different light exhibits intricate, delightful form. Our view of things is all a matter of perspective, both literally and figuratively! was to look at the world from a flower's point of view. So literally, here we are, down low and reaching for the sky. P.S. I'm off to teach art quilting and beading at the MN Quilters Show & Conference. I know they are weeds - but I still love them! Beautiful capture....friend in someone else's yard, lol. well you've elevated the lowly dandelion to glorious heights. wasn't this a fun exercise? I've had my misgivings about my own interpretations, but seeing the works of others liberates me from those. thanks for visiting my blog, I truly appreciate that, and your words of support. I hope to visit you again soon, and have loads of fun in Minnesota. I had to laugh at your photo and title! EXACTLY how I feel about some very lovely 'weeds'. Wonderful photo! Beautiful perspective! Have fun teaching. I love the light in this image...the flower POV really worked in your favor and truly makes this more than a weed-despite it's reputation. 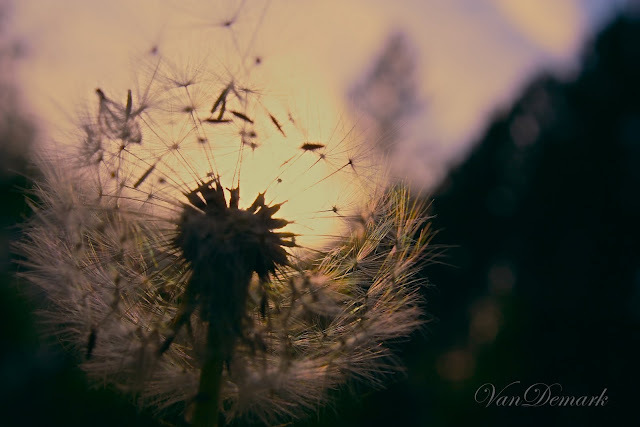 Oh, I love the dark/light and light/dark contrast you captured in this one dandelion. I love your words too! Perfect point of view. Thanks so much for your participation in Exploring with a Camera. Enjoy your conference! I have often said that if they were not so invasive, people who be planting them in their flower gardens. The flower itself it quite lovely. So funny you wrote this. I always tell Rich that I have no idea why people hate them so much when they are the first "color" we see after a long, white winter. Then they die off right away and are gone for good. Way to stand up for the dandelions Anna! Have a wonderful time at your class! A new and lovely perspective on the dandelion. This spring brought forth a lot of photos of the humble dandelion and some of them were truly amazing - but you've taken things to another level with this photo. Just wonderful. The light and composition are just wonderful. I love them, and this photograph is just beautiful Anna! Love the point-of-view. Always amazing what we find when we change from where it is we're looking! I never paid attention to dandelions before this year when I took up photography---what fun they are to capture. This is surreal. I like the photo challenge of taking a shot from a flower's point of view, never really thought of it that way before! This is a fantastic capture! I love the way you composed it...far from ordinary! oh wow .. I see what you mean Anna ..this is really so amazing ..they are fun to take photos of! !